There is absolutely no question that the community of Valley East is in the middle of a tremendous growth period. We see new subdivisions and homes being developed all over the place, but the real indicators are that new schools and new businesses are being built in the community – true signs that we are on the verge of a population explosion like we’ve never experienced before. It is now time to give Valley East an identity that will clearly demonstrate what our true nature is all about! When someone asks you to describe the community of Valley East , you want to be able to give them a short, quick answer that says it all and you need a simple but effective and identifiable logo that will be recognized as Valley East ’s own. A number of years ago The City of Toronto unveiled its branding campaign – Toronto Unlimited! The goal was to create a single Toronto brand and to develop a fresh new way of communicating the city’s strong and dynamic identity to the rest of the world. The signature line Toronto Unlimited, is meant to celebrate the unlimited potential of the people and the endless opportunities they offer in the city. We too need a starting point! So I am offering the suggestion above as the brand we should adopt for Valley East . VALLEY EAST – A PLACE TO GROW says it all. Growth implies progress and development, not only in a personal sense, but also with respect to business, community spirit, empowerment of our youth, etc. People are always saying that Valley East is a great place to raise a family; a great place to start a business; a great place for finding satisfaction in recreational, cultural or sports fields; in other words, it is a great place to grow and develop, regardless of your personal preferences or goals. Growth also means progress. If you are looking to improve yourself spiritually, intellectually, psychologically, socially, culturally, physically – or in any other way you can think of, Valley East will offer you that opportunity to achieve your goals and dreams. Valley East - A Place To Grow! When the official flag of the Town of Valley East was created by the Public Affairs office of the Regional Municipality of Sudbury, it was designed to demonstrate the natural beauties of the community. It was proudly flown at all public buildings and during special events. The white off-set 'V' separates the Town's official colours: blue on top depicting sky and water, and green below depicting the lush vegetation of the region. The 'V' obviously stands for Valley East and the white represents the Northern Snow. It is a simple design, which makes it all the more majestic. The official crest of the Town of Valley East was included on the flag. It consists of a shield between two banners with the name of the town on the top banner and our motto - Peace, Plenty, Progress on the bottom banner. All wording is in both English and French, reflecting the bilingual nature of the community. The shield of the crest is divided into five sections. In the top left segment is a black plow on a green background representing the town's agricultural sector. The top right section contains three fleur-de-lis on a blue background indicative of the town's French Canadian origins. In the lower left corner, white, crossed surveyor's flags on a blue background recall the early development days and a black stylized ore car on a green background depicts the town's mining industry. At the bottom of the shield are three green maple leaves on a white background representing the Town's early forest industry. As I stood beside the pond in my back yard admiring the new waterfall that my wife had recently constructed, I was reminded of a song released a long time ago by the famous singer, Harry Belafonte. The main feature of the pond was a bucket turned over on its side, allowing the water to flow freely out and down the hill in a stream. The song by Belafonte, a banter between a husband and wife about fixing a hole in the bucket, suddenly hit me that the lyrics were symbolic of what is happening in the Greater Sudbury Area, and in particular in Valley East. "There’s a hole in the bucket, Dear Lisa, Dear Lisa. There’s a hole in the bucket, dear Lisa, a hole. Well fix it, dear Henry, dear Henry. Well fix it, dear Henry. Fix it! With what shall I fix it, dear Lisa, dear Lisa. With what shall I fix it, dear Lisa. With what? With straw, dear Henry, dear Henry. With straw, dear Henry. With straw. The straw is too long, dear Lisa, dear Lisa. The straw is too long, dear Lisa, too long." And so the song goes on and on with Henry stating that the ax is too dull to cut the straw, and Lisa eventually telling him to wet the stone to sharpen the ax. Henry finally comes to the point where he asks with what he should carry the water to wet the stone and is told to fetch it with a bucket, to which he replies, "There’s a hole in the bucket, dear Lisa, dear Lisa. There’s a hole in the bucket, dear Lisa. A Hole." The song is a rather silly rendition, except that it says a lot about what is going on in our community today. Our population is declining; our unemployment rate is one of the highest in the country; our children are moving away to find jobs; our small businesses are having a hard time surviving; restructuring of our municipality is not going the way it was planned; our hospital is in financial trouble; the list goes on and on. The fact is: we have a hole in our bucket and until we fix it, we will have a great deal of difficulty generating any kind of economic stability in this area. Having lived in Valley East since 1974, and all of my life in the Greater Sudbury Area, I realized that if I could make any difference at all in bringing the region out of the hole into which we were sinking, I had to make an effort. I want people to remember me as a person who was not afraid of accepting the responsibility for making positive changes in this community. There have always been those who say that Valley East has no real identity and that people living here have no real sense of community - nor do they want to develop a sense of community. They complain about everything and tend to give up easily. These people remind me about a story about two frogs which fell into a deep bowl of cream. One was an optimistic soul, but the other took the gloomy view. "I shall drown," cried the pessimist. "And so shall you." So, with a last despairing cry, he closed his eyes and said "Good-bye" and sank into the cream and died. The people who do not believe in the potential of Valley East declare that we will never amount to anything. They take on the gloomy view and say that it is useless to even try. On the other hand, there are those who have devoted their lives to working for the good of the community. They are people like the volunteers who have worked so hard as part of a multitude of community groups. You will read about those people on this web site. Those people remind me of the other frog which fell into the deep bowl of cream. After its partner gave up and sank to the bottom, the other optimistic frog said, "I can't get out, but I won't give in! I'll swim around till my strength is spent. If I have to die, at least I will die content knowing that I didn't give up." And the frog bravely swam around and around the bowl until his struggles began to churn the cream. Finally he came to rest on top of the hardened butter which had been made as a result of his continuous swimming. He then hopped out of the bowl to safety. I admire the people who have decided to continue to try their best to build and develop a sense of community in this fine municipality of Valley East. At times, it must seem as if no one is listening and your struggles are for naught. But let the lesson of the struggling frog be an inspiration. One day the cream will turn to butter and Valley East will hop out of the bowl to the bright future which awaits us all. We are proud to do what we can to make a difference with Valley East Today. By building this web site into one of the most comprehensive community web sites in the country, we will ensure that people all over the world have an opportunity to share in the celebration of our 100 plus years of existence. I invite all residents of Valley East to make a resolve to take the optimistic view and to support the people, who, year after year, put in hundreds of hours to provide us with opportunities to come together as a community. The best way that we can show our appreciation to these people is to take part in the events that they organize year after year. We live in one of the finest communities in Ontario. Let's show others, through our words and deeds, that we truly believe in the future of Valley East and that we are proud to call this community home. As the years go by we are all reminded of the harsh reality that our life is unfolding and that we can never change our past. This reality becomes clearer as you get older. I spent a great deal of time thinking about life in general as we celebrated 100 years of existence as a community during the year 2004, ten years ago. I know many of you will be reading this editorial after the final candle is blown out on the birthday cake, but nevertheless, now that we are in our 2nd Century, the points still apply. How should we approach this living history of our community? What is it that we want to remember? Moreover, what is it that we want Valley East to stand for? And then, the answer seemed to jump out at me as I was reading a little passage recently. It was a selection from "The Hymnbook", written by Arthur Bowler. Every parent will understand why I was greatly moved by the story and I’m sure every parent could also recount a similar experience. It was then that I realized that each and every resident of Valley East is a parent of our future. Our values today will shape the future for our children. That is what this web site is all about. Recording details of our past which will shape our future. Suddenly, everything became clear to me as I read the following passage. I now know how to approach this web site. We will record our history, and we will focus on the things that really mean the world to us: people, tolerance and love. I watched intently as my little brother was caught in the act. He sat in the corner of the living room, a pen in one hand and my father’s hymnbook in the other. As father walked into the room, my brother cowered slightly. He sensed that he had done something wrong. From a distance, I saw that he had opened Dad/s brand-new book and scribbled across the length and breadth of the entire first page with a pen. Now, staring at my father fearfully, he and I both waited for his punishment. My father picked up his prized hymnal, looked at it carefully, and then sat down without saying a word. Books were precious to him. He was a pastor and the holder of several degrees. For him, books were knowledge, and yet, he loved his children. What he did in the next few minutes was remarkable. Instead of punishing my brother; instead of scolding or yelling or reprimanding, he sat down, took the pen from my brother’s hand and then wrote in the book himself, alongside the scribbles John had made. "John’s words in 1959, age two. How many times have I looked into your beautiful face and into your warm, alert eyes looking up at me and thanked God for the one who has now scribbled in my new hymnal? You have made the book sacred, as have your brothers and sister too so much of my life"
Wow, I thought. This is punishment? From time to time I take a book down—not just a cheezy paperback, but a real book that I know I will have for many years to come—and I give it to one of my children to ‘write’ their names in. As I look at their artwork, I think of my father, and how he taught me about what really matters in life: people, not objects; tolerance, not judgement; and love, which is at the heart of a family. I think about these things, smile, and I whisper, "Thank you, Dad." People, tolerance and love—the things that really matter in life. As I meet people in the years to come I will be asking for them to share the things that really matter in life. Provide the stories for us so that we can post them on this internet history book for others to read and become inspired as they in turn create history. Perhaps all we need to be truly happy in this world is a return to the basics of life: people, tolerance and love. My long range plans for this web site are going to reflect the really important things. If I do that, I am sure all the rest will fall into place. "A special invitation to all residents of Valley East to join together in celebrating a hundred years of history as we take a giant leap into a bright and exciting future!" Opportunity is the same way. It is everywhere. Opportunity is so freely available that we take it for granted. Yet opportunity alone is not enough to create success. Opportunity must be seized and acted upon in order to have value. So many people are so anxious to "get in" on a "ground floor opportunity," as if the opportunity will do all the work. That's impossible. Just as you need air to breathe, you need opportunity to succeed. It takes more than just breathing in the fresh air of opportunity, however. You must make use of that opportunity. That's not up to the opportunity. That's up to you. It doesn't matter what "floor" the opportunity is on. What matters is what you do with it. After reading this passage I understood what I had to do. I realized that CELEBRATION 2004 is the ‘Opportunity" we had been waiting for in Valley East. It was our chance to come together as a community, to return to the spirit which once permeated all of our subdivisions many years ago. In recent times our ‘sense of community’ has disappeared. Valley East lost its identity with the amalgamation into the City of Greater Sudbury. Many feel that the City of Greater Sudbury itself has been searching unsuccessfully for a sense of identity. It is now clear to me that the people of Valley East have an opportunity of a lifetime to bring that community spirit to life and to take a leadership role in the entire region. What is important is that everyone in Valley East take advantage of the opportunity. It is time for all organizations, religious groups, schools, sports associations, playgrounds, senior citizens and people who care about the future of this great community to come together and share in more than merely a 100th Birthday celebration - this is a CELEBRATION OF LIFE, YESTERDAY, TODAY AND TOMORROW - and it starts now! Let the CELEBRATIONS CONTINUE - FOREVER! 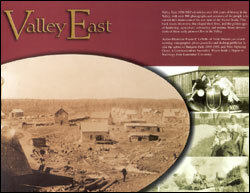 A History of the first 100 years of development in Valley East is now available as a lasting souvenir book. Only 3000 copies were printed of this collector's edition. 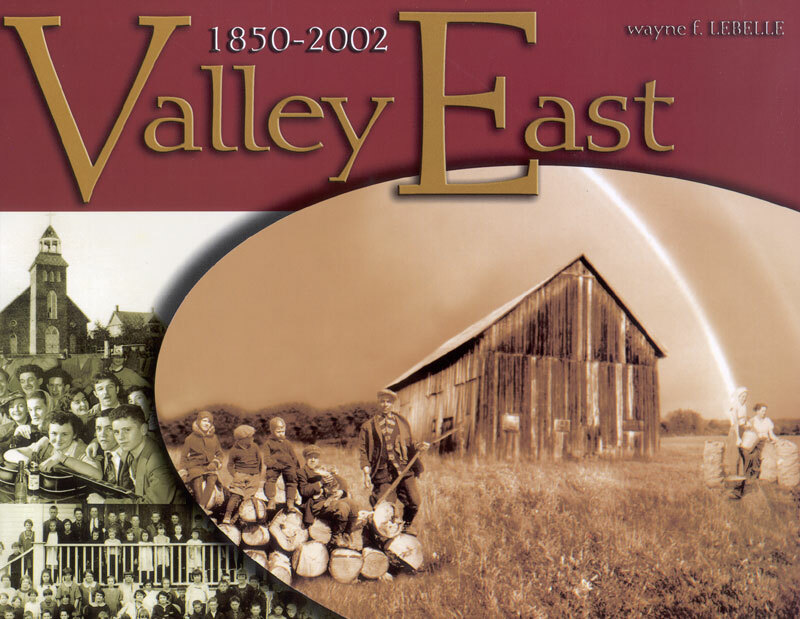 Valley East 1850-2002 chronicles over 100 years of history in the Valley, with over 900 photographs and accounts of the people who carved their homes out of the raw land of the Nickel Basin. This book traces the events that shaped their lives, and the golden ages of lumbering, agriculture, railroading and mining. Many descendents of these early pioneers live in the Valley. We all need to make some serious choices today that we can live with tomorrow. It is a time for business owners and community leaders to step forward and build a better future for our children by taking some action today. To illustrate the point, let me share a little story that is a real favourite of mine. It is called, The Carpenter. I don’t know who the original author was, but it was obviously a very wise person. An elderly carpenter was ready to retire. He told his employer-contractor of his plans to leave the house-building business and live a more leisurely life with his wife enjoying his extended family. He would miss the paycheck, but he needed to retire. They could get by. The contractor was sorry to see his good worker go and asked if he could build just one more house as a personal favour. The carpenter said yes, but in time it was easy to see that his heart was not in his work. He resorted to shoddy workmanship and used inferior materials. It was an unfortunate way to end a dedicated career. When the carpenter finished his work the employer came to inspect the house. He handed the front-door key to the carpenter. "This is your house," he said. "My gift to you." The carpenter was shocked! What a shame! If he had only known he was building his own house, he would have done it all so differently." A GREAT STORY! A GREAT LESSON! We all build our life one day at a time. Often we make poor decisions or do things that we regret and then realize that we have to suffer the consequences of those decisions. We know that if we had it to do all over again we would, but we can’t turn back the clock. We are forced to live with our decisions - good or bad. Each and every one of us is a carpenter, building our own house. The sooner we realize that it is our house and that we will have to live in it for the rest of our life, the sooner we will start weighing the consequences of our "construction". We will then put our best efforts into the building so that we will be able to enjoy the comforts and security of these good decisions and choices. Each day of your life you are hammering nails, placing boards or erecting walls in your personal "house". 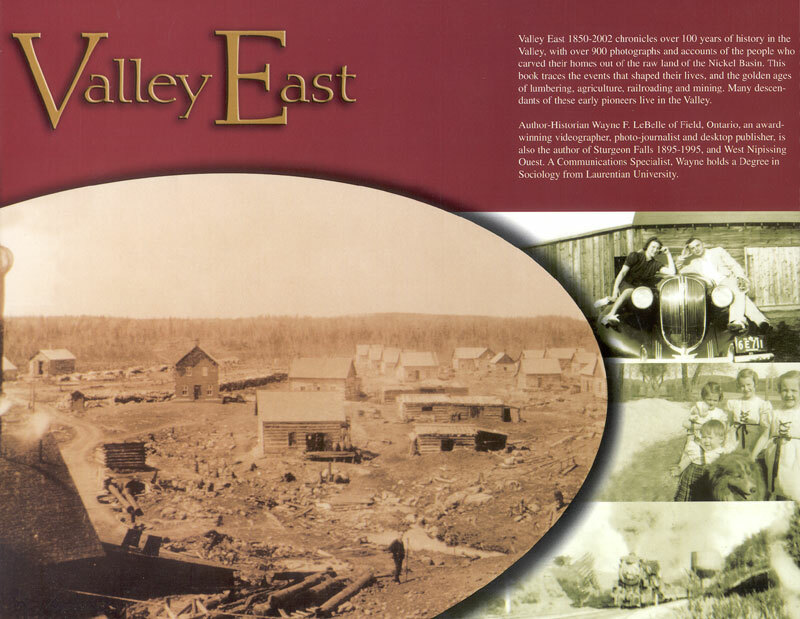 Before amalgamation, people were generally proud to call Valley East home. Valley East meant something, especially since we could call ourselves the City of Valley East. And then we were asked to build another house. That house was called The City of Greater Sudbury. This was not something we wanted, and most of us were not really excited about constructing this new home. We celebrated our 100th birthday in 2004. We are celebrating our 110th birthday in 2014. It is now time for everyone in Valley East to get up, dust off our clothes, and get busy rebuilding our home. It is time to become truly aware of the good things that are going on in Valley East and to support our friends and neighbours in their efforts at improving the quality of life of those around us. We don’t have to wait any longer for things to happen in the Greater Sudbury Area. It is time for Valley East to take the lead and rekindle the kind of community spirit for which we were once known throughout the province. We have two very effective communication tools at our disposal with which to create the level of awareness which is necessary to develop a strong community spirit. This web site, www.valleyeasttoday.ca contains a wealth of information about Valley East and should be used by all community leaders to let everyone know about their activities and projects. It is time for us to set the building blocks for a community in which we want to remain for the rest of our lives. Let’s build a proud and strong Valley East today that we can be proud of tomorrow! Our Valley East Face Book Group https://www.facebook.com/groups/valleyeasttoday/ is approaching 1400 members and with each person on Face Book having an average of 130 Friends, this gives us the potential to reach out to over 150,000 people in a single day with a single post. An amazing statistic. There once was a slave named Androcles who escaped from his master and fled into the forest. As he was wandering about he came upon a lion lying down moaning and groaning. At first he turned to run away, but when he noticed that the lion did not chase him, he turned back and went up to the mighty beast. As Androcles came near, the lion put out his paw, which was all swollen and bleeding. When he looked at the paw he saw a huge thorn which was stuck in it causing all the pain. Androcles pulled out the thorn and bound up the paw of the lion who was soon able to rise and lick the hand of Androcles like a dog. The lion then took Androcles to his cave and every day brought him meat on which to survive. Shortly afterwards, both Androcles and the lion were captured and the slave was sentenced to be thrown to the lion which had been kept without food for several days. The Emperor and his people came to see the spectacle. Androcles was led out into the middle of the arena. Soon the lion was released from his den and rushed bounding and roaring towards his victim. But as soon as the lion came near to Androcles, he recognized his friend and fawned upon him, licking his hands like a friendly dog. When the Emperor was told the whole story, Androcles was set free and the lion let loose to return to his native forest. This story has a great deal of significance for us today. Even though there appears to be much prosperity and wealth in the world today, when we look closely at the situation, we see a completely different picture. There are hundreds of people living in Valley East who are living in poverty, and like the lion in the story, are reaching out for help of any kind to pull them out of this desolation. There are also many businesses in Valley East which are struggling to survive in these uncertain economic times. With a recession on the horizon and decreasing sales figures, a lot of local businesses have been forced to reduce staff and cut back drastically in all areas in order to keep their doors open in hope of a better future just around the corner. It is not certain how long they can hang on and they too are reaching out for help to pull them out of despair. Finally, the rest of us find ourselves in the enviable position of having good jobs and steady income, but yet, we too are finding that skyrocketing costs are eating up much of our money, forcing us to cut back on spending and search for cost-saving alternatives. We too are reaching out for help. In the story, Androcles had just escaped and was wandering the forest without any food, knowing that his freedom could disappear at any time, meaning certain disaster. The lion was hurt and needed someone to help him take away his pain so that he could once again walk the forest with confidence. It was Androcles who made the first move to save the lion. Once the lion recovered, it was the lion’s turn to help out Androcles. And in the stadium, the bond between the lion and Androcles stood the ultimate test, resulting in both earning their freedom. Valley East has a lot in common with the story about the lion and Androcles. Our community is all about businesses and consumers living in harmony in a circle of support. The businesses of Valley East are not looking for customers from Sudbury or the surrounding towns. They are here to provide goods and services to the residents who live in Valley East. Consumers who shop locally help keep the businesses viable and healthy by increasing their sales. As businesses increase their sales, it enables them to expand and put more people to work. By reaching out to help each other - that is with residents who are willing to support local businesses and with businesses who are willing to provide local residents with good value for the goods and services purchases - we will all benefit from the power of this Community Circle of Support and move forward into a brighter future with the confidence that we are all in this together. 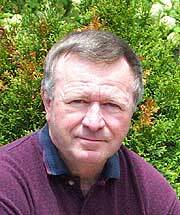 "Residents of Valley East Are Indeed Fortunate When It Comes To Being Informed. However, This Good Fortune Should Not Be Taken For Granted." When it comes to being informed about community events and the accomplishments and achievements of local residents, Valley East surely must count its blessings. The Vision Paper was delivered to each home in Valley East and Capreol for over 10 years. Each week it contained a wealth of information about things that are most important to people living in this part of the City of Greater Sudbury. Each week it provided a venue through which businesses and individuals could communicate to more than 25,000 people. Pierre Charette, owner of The Vision Paper, along with Jean Guy Charette and the entire staff of the company are to be commended for their years of hard work while they operated this publication. Unfortunately, The Vision Paper ceased publications at the end of 2009. 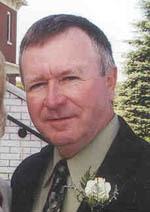 Now we must take the next step and use technology in the form of www.valleyeasttoday.ca , our own community electronic publication and our Face Book Group which can be found at https://www.facebook.com/groups/valleyeasttoday/ These have become our Window to the Community through which informatiion can be "seen and acknowledged". Perhaps the best way to introduce the main message of this editorial is to use one of my favourite stories. I simply call it "The Little Red Hen". One day a little red hen was scratching around in the barnyard when she discovered some grains of wheat. She had a great idea and called all of her barnyard neigbours together. "If we plant this wheat, we shall have bread to eat. Who will help me plant it?" "Not I," said the cow. "Not I," said the duck. "Not I," said the pig. "Not I," said the goose. "Then I will," said the little red hen. And she did. The wheat grew tall and ripened into golden grain. "Who will help me reap my wheat?" asked the little red hen. "Not I," said the duck. "Out of my classification," said the pig. "I’d lose my seniority," said the cow. "I’d lose my unemployment compensation," said the goose. At last it came time to bake the bread. "Who will help me bake the bread?" asked the little red hen. "That would be overtime for me," said the cow. "I’d lose my welfare benefits," said the duck. "I’m a dropout and never learned how," said the pig. "If I’m the only helper, that’s discrimination," said the goose. She baked five loaves and held them up for her neighbours to see. They all wanted some and, in fact, demanded a share. But the little red hen said, "No, I can eat the five loaves myself." "Excess profits," said the cow. "Capitalist leech," screamed the duck. "I demand equal rights," yelled the goose. And the pig just grunted. And they painted "unfair" picket signs and marched around and around the little red hen, shouting obscenities. When the government agent came, he said to the little red hen, "You mustn’t be greedy." "Exactly," said the agent. "That’s the wonderful free enterprise system. Anyone in the barnyard can earn as much as he wants. But under our modern government regulations, the productive workers must divide their product with the idle." And they lived happily ever after, including the little red hen, who smiled and chuckled. "I am grateful. I am grateful"
But her neighbours wondered why she never again baked any more bread. Valley East Today is the window to the community. But it takes the support and cooperation of individuals, organizations and businesses to keep the window clean. Businesses must use the publication to advertise and promote their goods and services so that the Vision has enough funds to provide space to report on all of the activities. We encourage people in the community to send us information that can be posted on the web site at . Unless people take advantage of this opportunity, the window will be useless. It takes a lot of hard work to bring you publications like www.valleyeasttoday.ca and https://www.facebook.com/groups/valleyeasttoday/ This hard work must be supported by local businesses and local organizations. Individuals must contribute stories and let us know about events that are going on so that they can be covered. Take pride in your community and make a sincere effort to "look through the windows"
Let’s all do our part and we can all share the bread! We Need Not Be Afraid of Adversity. It Will Make Us Stronger! As the community of Valley East continues to struggle in the face of a large economic slow-down, it is becoming clear that our entire future will depend on the courage and tenacity of young people who are willing to avoid the lure of greener pastures in the south. Many years ago I took part in a celebration which recognized close to one hundred young entrepreneurs who have set up business in the City of Greater Sudbury during the past ten years or so. Some of those businesses set up in Valley East. It was a very touching ceremony, especially in light of my background in marketing and advertising. I know that small businesses are struggling. I also know that many people who depended on those small businesses for part-time employment have lost their jobs and they too are struggling to make ends meet while attempting to remain in the Sudbury area. A gentleman by the name of Neil Eskelin once said that the way to understand adversity is to take two identical acorns from the same oak tree and plant them in two different locations. Plant the first one in the middle of a dense forest, and the other one on a hill by itself. The oak standing on a hillside is exposed to every storm and gale. As a result, its roots plunge deep into the earth and spread in every direction, even wrapping themselves around giant boulders. At times it may seem the tree isn’t growing fast enough, but the growth is happening under ground. It’s as if the roots know they must protect the tree from the threatening elements. On the other hand, the acorn planted in the forest becomes a weak, frail sapling - having to compete with giant oaks for nutrients and space. And since it is protected by its neighbours, the little oak doesn’t sense the need to spread its roots for support. A young person, or even an older person for that matter, who decides to set up business in Valley East is well aware of adversity and challenges. The business will face many “storms”, especially in the early going. The business owners will have to be very much aware of opportunities and be willing to change direction often in an effort to establish strong roots in the form of relationships and associations. The young entrepreneur will have to pay a great deal of attention to quality of work and be responsible for providing only the best of service to clients. At times, it may seem as if the business is doomed to failure, and the long, hard hours of dedication and work will be difficult to take. Growth will also be very slow as the business spreads its roots throughout the community in order to survive. These are two very important lessons, not only for young entrepreneurs, but for anyone who has enough confidence in this region to remain in Sudbury, and in particular, Valley East, and build a life here. First of all, don’t be afraid of disappointments, frustration and adversity. It will make you stronger and help you develop a strong root system, which will enable you to survive all storms you will face over the years. Secondly, don’t wait for someone to bring you success. You have to get up and get it yourself. Good luck to all young people who are ready to give Valley East a shot. Our future depends on you. Have you ever watched geese flying along in the sky in a “V” formation? They fly like that because as each bird in front flaps its wings it creates an updraft for the bird immediately following. By flying together in a “V” formation, it has been estimated that the whole flock adds over 70% to its flying range than if each bird flew on its own. This means that the flock can cover their journey much more quickly and with much less of an effort by working together. Geese work together so that the entire flock achieves a higher degree of success. You would think that people would be able to discover this strategy as well. It is a known fact that the City of Greater Sudbury is in trouble. Unemployment is up! Businesses are closing! The hospital construction has stopped! We are losing our youth to the south! Many small businesses which are still operating are barely surviving! The jobs that we are losing are high paying jobs in big industry, but the jobs that we replace them with are low-paying entry-level jobs. There is no need to go on. Yet, in spite of this, we all share a common direction. Everyone living in the City of Greater Sudbury really wants to do something to improve the situation. We want to help stimulate the economy and create new jobs so that our children can establish a future in their home town. It is precisely this sense of community and common direction which we must harness and use if we have any chance of rising out of our current state and creating a brighter future for everyone in the area. In order to see how we can do this, we must once again take a lesson from the geese. The situation in Sudbury is bleak, and we must take action soon in order to correct the situation. Since we are all moving in the same direction, we can travel on the thrust of one another and thrive on the encouragement and support. What the Greater Sudbury Area needs now is leadership. Valley East is more than capable of providing that leadership. Together, we can use Valley East Today to create the leverage we need to make our own community stronger and then move out to the front of the pack to help bring the rest of the flock - the other municipalities in the City of Greater Sudbury - in the right direction. We ask that every resident of Valley East make a sincere effort to do their part to help make this community stronger. 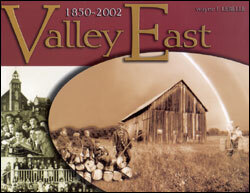 Valley East once held enviable position of being the fastest growing municipality in the region. We still are and we can still hold our heads up high. Amalgamation may have taken away our right to call ourselves the City of Valley East, but that was just a name. We haven't changed as a people. We haven't changed as a community. It is time to move forward, and take a lesson from the geese. It is our turn to move to the front of the formation and lead the flock. Let's prepare for the journey. It is going to take every bit of strength we can muster.